Brunch is the ultimate meal time combination – and Little Evie knows just how to do it right! 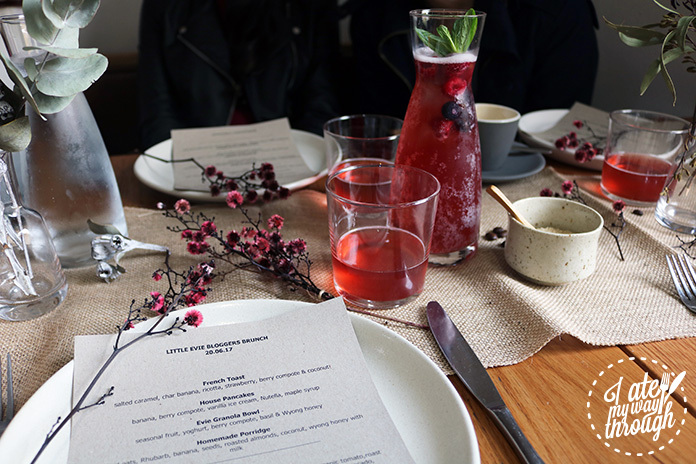 This quaint cafe invited IAMWT to their bloggers brunch to celebrate some of the yummy things on their menu. With rustic touches like hessian runners over wooden tables, dried native flowers and a clean cut aesthetic by Adam Burns of Design Portfolio, the space has a lightness to it. It’s the perfect place to come, relax and recharge as light washes over you from the huge windows looking out to a tree lined street. 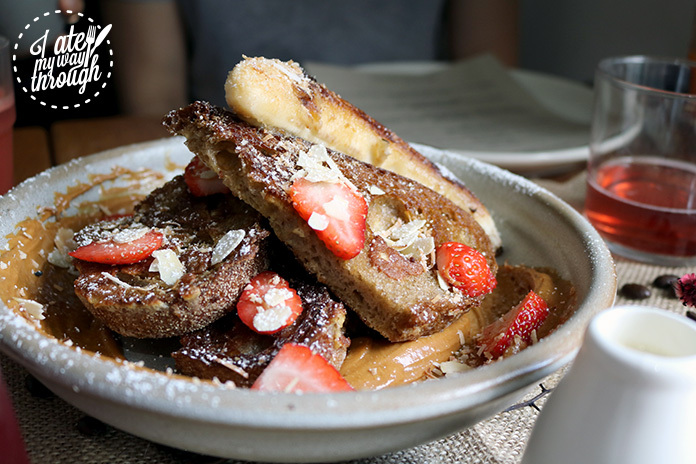 Little Evie’s take on french toast with a salted caramel lined bowl, charred banana, ricotta, fresh strawberries, berry compote and coconut flakes is a decadent representation of the classic dish. We had spoons flying left, right and centre to try and get the last scoops of the salted caramel which was purely divine. The toast itself was nice, with good crunch and cinnamon flavour. I adored the house pancakes! 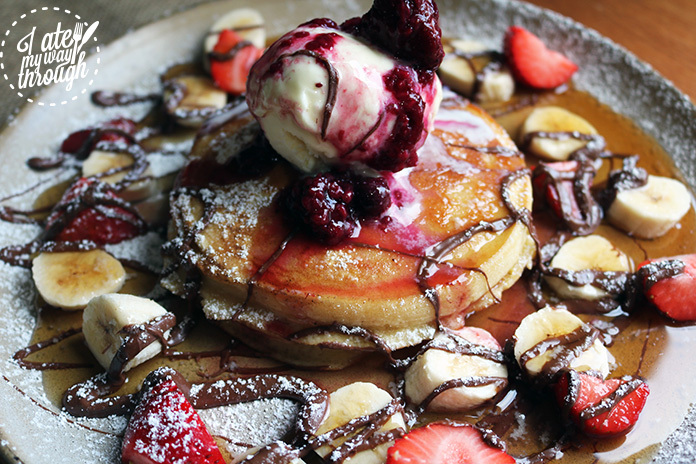 With all the good stuff like fresh bananas, strawberries, berry compote, vanilla icecream, nutella and maple syrup atop of two healthily thick hotcakes it’s absolutely a ‘treat yourself’ kind of breakfast. The pancakes were well cooked, light and fluffy with a tasty mixture and everything in the dish was enough to leave you more than satisfied. Sunday brunching and need to counteract a few vinos from the night before? 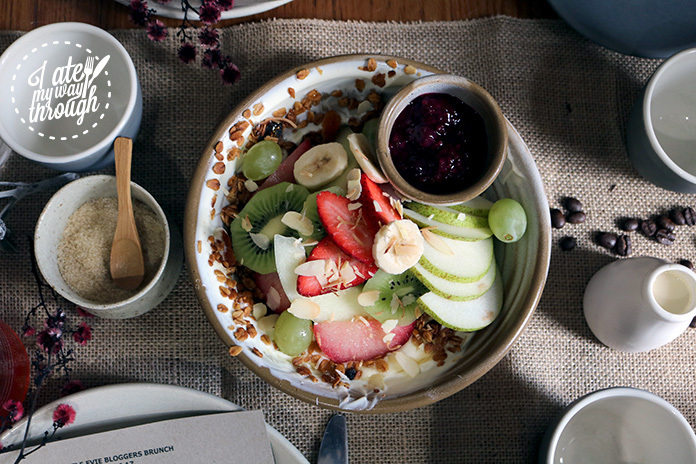 Try the Evie granola bowl with fresh seasonal fruit, yoghurt, berry compote and locally sourced honey from Wyong, its a sweet and fruity dish. All the flavours were perfectly balanced. As an added bonus, it comes served with your choice of milk too. My favourite parts of this dish were the berry compote, pear and granola. 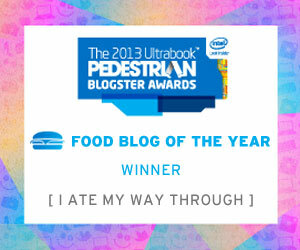 One of my favourite dishes of the day would have to be the homemade porridge. 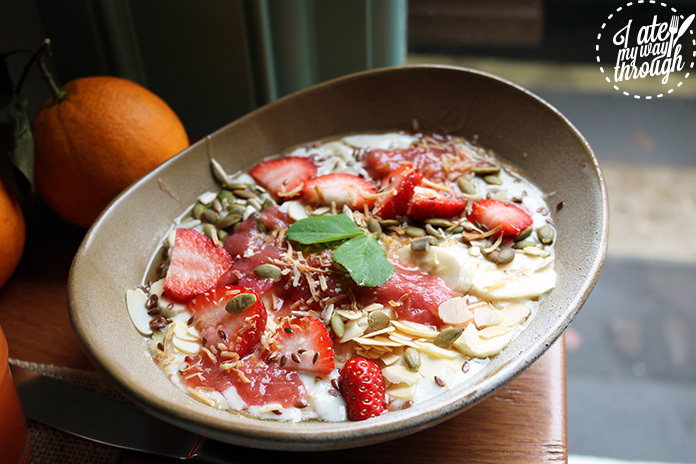 Rolled oats, stewed rhubarb, banana, seeds, roasted almonds and toasted coconut then drizzled with Wyong honey. This generous bowl of scrumptious porridge makes for a hearty breakfast to chase away the winter chill, leaving you feeling warm and content. 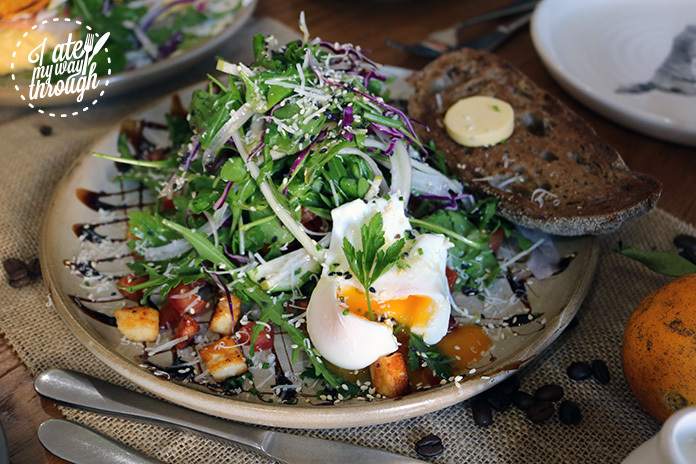 Breakfast bruschetta with chorizo, haloumi, a poached egg, Brickfields naturally leavened sourdough and a stack of salad is one Little Evie example of a great brunch dish. I loved the cubes of chorizo and haloumi spread over the plate, and with the drizzle of balsamic vinegar I was sold. The perfectly poached egg and sourdough really played into the breakfast part of the dish, and were cooked well. The salad was a refreshing touch and left you feeling sated. The lemon myrtle cured salmon was, I thought, a lovely way to incorporate native ingredients into an already yummy dish. 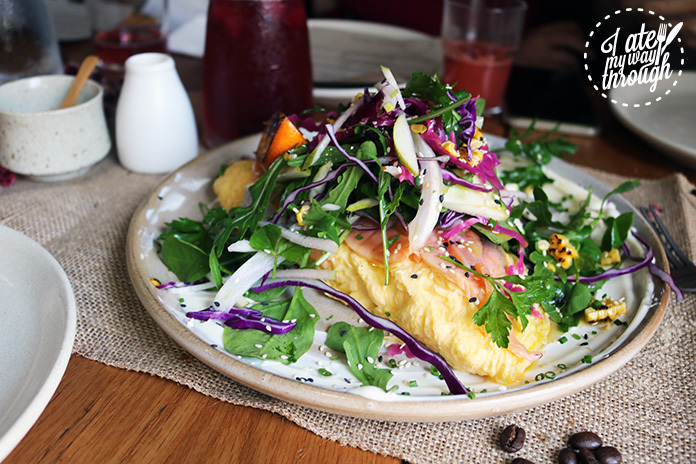 The seasoned scrambled eggs with pickled cabbage, watercress, roast tomato, fennel, yoghurt and Brickfields sourdough toast makes for a mighty delicious and mighty hearty dish to kick start your morning, and your taste buds! The lemon myrtle salmon was not an overwhelming flavour, but definitely added a further dimension to the dish. If you’re in the market for a sunny spot just outside the city or a new place to call your local, look no further than Little Evie. With pleasant staff and food that reflects their passion, it’s a no brainer to give them a try.